This poem, again, was written for school, and (as always, since this is when my inspiration comes) was written at midnight, the night before it was due. 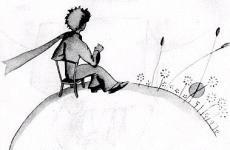 I think any poetry advocate would enjoy this, especially if you have read "Le Petit Prince" by Antoine de Saint-Exupery, which provided the inspiration (not necessarily the content) for this poem. So they can live their lives and freely love. And I don’t remember that there’s a lack of doves. And maybe, just maybe, there is some light. And poor young souls like you don’t have to fight. When all you could do was to go past that door. When all that I want to see is past a door. Did you have to leave me bruised and dark and sore? © Copyright 2019 hockeyguy. All rights reserved. Good write. I enjoyed reading this. You painted quite the picture for with such amazing imagery. Flowed and paced well. You should write more. You have a talent for it. "Did you have to leave me bruised and dark and sore?" Comments like yours make it much easier to show my work to other people without being shy about it. Thanks a bunch! Maybey you should change your name to WriterGuy. This is really good work. I hope you have an opportunity to enjoy some creative writting courses in college. You really are showing some real potential tallent. Thank you very much for reading it, and thanks so much for the compliment. It always makes someone more confident to hear something like that. Thank you very much for your comment. It's really encouraging!